Amy D. Singer - Tampa Full-Service Law Firm | Allen Dell, P.A. 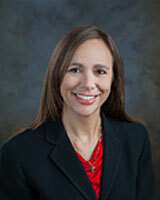 Amy D. Singer is a native of Tampa, Florida and a shareholder with the law firm of Allen Dell, P.A. She joined the firm in 2003 as an associate. Ms. Singer concentrates her practice in the areas of family law/domestic relations, mediation and litigation, helping families resolve their issues without litigation when possible. She is also collaboratively trained in family law. Prior to practicing law, she had approximately nine years of experience in the area of family law as a legal assistant and paralegal.